Anonymous sources have indicated that Marvel might be in the process of creating a solo book for the oft-revived X-Heroine. If there's one thing that Marvel's good at, it's reviving X-Men. The cast of the X-verse is a practical smorgasbord of characters who have been killed just to come back to life later on. The queen bee of this crew of never-dies, of course, is Jean Grey, the subject of some of the franchise's most controversial revivals. Most recently, writer Brian Michael Bendis circumvented the character's demise by bringing her teenage version through time to the present day. Now, if recent can be believed, Bendis and company may gearing up to give the time-displaced telepath her on solo series. These rumors come by way of anonymous sources close to Marvel who have reportedly seen an in-preparation logo for a Jean Grey solo book. And while that on its own might not be enough to convince people that such a series is in the works, past comments from Bendis himself have also served as fuel for the fire. 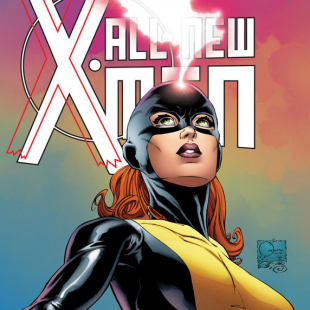 For instance, responding to a fan query in June, Bendis named Jean Grey as the character he most wanted to see with her own solo series. Responding to another fan's question, in turn, he indicated that the character future sounded "like a great idea for a Jean Grey solo series." Granted, that's still pretty far from a confirmation, but it's still enough to hint at something going on behind the scenes at Marvel. And just speaking personally, I'd be excited to see where a Jean Grey series could go. She often isn't some people's favorite character, but Bendis has done some genuinely interesting things with Jean Grey in All New X-Men, playing smartly with Jean's understandable turmoil over the fact that her life as an X-Men winds up being pretty horrible. A solo book exploring that a bit more deeply would be something I could definitely get behind.